Underdogs rejoice! 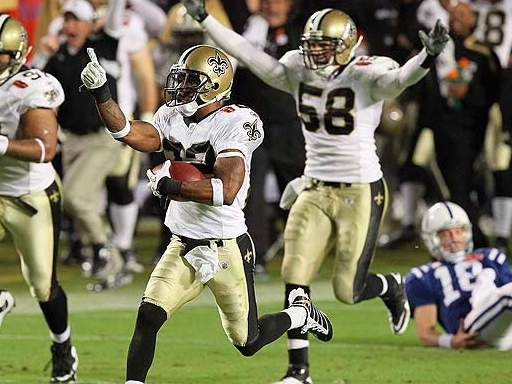 One of pro sport’s most hapless franchises the New Orleans Saints are Super Bowl Champions. Carrying the hopes of a plagued city on their backs, the Saints erased decades of futility and defeated the Indianapolis Colts 31-17 Sunday. Drew Brees connected on his final 10 passes and tied Tom Brady’s Super Bowl record for completions (32) in leading the Saints to victory. Future Hall of Fame quarterback Peyton Manning sealed his team’s fate with a late 4th quarter interception that was returned by Saints defensive back Tracy Porter for the decisive touchdown. Many remember the 1980s when Saints fans wore paper sacks over their heads to games and called their own team the Aints. Sunday night Saints fans were partying on Bourbon Street in celebration the city’s first ever world championship. This is the classic have-not reaching the top of the mountain story and it has a message for us all. No matter how low you’ve been. No matter how many times you’ve been knocked down or denied, as long as there is breath there is hope. Five years ago the city of New Orleans was on its back. Tonight it’s on its collective feet. Have courage! Have strength! Know for certain that your tomorrow can be better than your today! This victory is one for all of us who keep the faith! Always remember a challenge only becomes an obstacle when we bow to it. For true believers like the New Orleans Saints, the city of New Orleans, and I hope you obstacles are only shortcuts to something better than you had planned. 2010 is MY year! This is the year I break free! This is the year I break through! This is the year I break out!